Sportsbetting.ag is an online sportsbook focused entirely on providing the latest betting markets, including options for major esports leagues and tournaments, for North American customers. Operating since 2003 and licensed in Panama, it has become popular with users from the USA who want quick access to the latest esports and traditional sports and racing betting markets. We have tested out Sportsbetting.ag to determine whether American and international esports fans looking to place bets on their favourite competitive matches will be well looked after. This review will take a look at the site’s reputation, esports betting markets, payment options and security to help you decide whether it’s your best option. Sportsbetting.ag is a USA-focused sports betting site and accepts sign-ups from North America. It stands out from the crowd for being one of the few online sportsbooks which take customers from all 50 states. Like other US-facing sportsbooks licensed overseas, Sportsbetting.ag leaves it up to each user to be informed of their local state legislation prior to signing up. We recommend doing your research to have complete peace-of-mind, but just know Sportsbetting.ag has a solid reputation with American customers, with no recorded cases of legal trouble for anyone betting there. Technically, Sportsbetting.ag accepts players from all countries, buts its heavy US-focus means it’s best suited for esports fans who want to place a bet from that region. If you are reading this review from United States, we recommend checking out BetOnline instead, as it more specifically caters to customers from your country and offers similar esports betting options, bonuses and payment methods. Sportsbetting.ag offers multiple bonuses and promotions for new players and those who stick around and bet often. Most bonuses are limited to different sections of the site (casino, racing, sport) but the best ones can all be taken advantage of and put towards your esports betting. Sign up to Sportsbetting.ag to start taking advantage of the offers listed below. 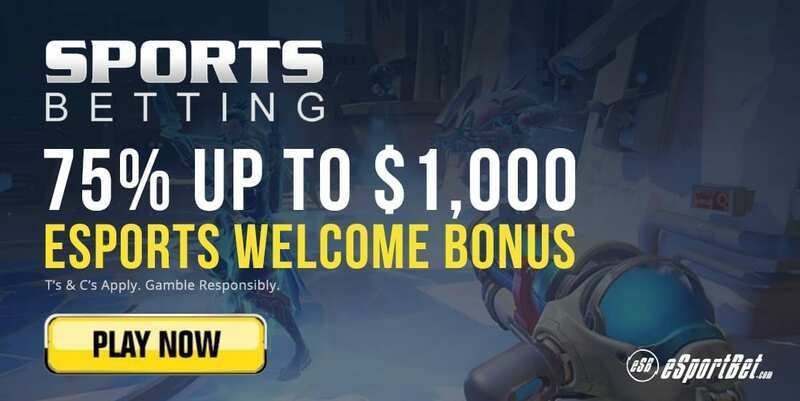 75% Sports Welcome Bonus: SportsBetting.ag will match your first ever deposit using your payment method of choice by 75% up to $1,000, using the promo code ‘NEW1000’. You must deposit a minimum of $25 to be eligible for the welcome bonus via any payment option that is not Neteller or Skrill, as they do not qualify for the bonus. There is a 12x rollover requirement when claiming this bonus. 100% Bitcoin Bonus: If you have never deposited using Bitcoin before, Sportsbetting.ag will match your first bitcoin deposit by 100% up to $1,000 maximum. You must deposit a minimum of $20 to be eligible and enter the special promo code, ‘BTC2017’ before processing the deposit. There is a 14x rollover requirement when claiming this bonus. Overall, it’s a solid few bonus offers, and we recommend reading the promotional terms and conditions at the Sportsbetting.ag bonus page for more information. If you are unfamiliar with what rollover requirements are, please read our wagering requirements guide before signing up and depositing anywhere. Sportbetting.ag offers live, early and outright betting markets on the most popular esports leagues and tournaments held nationally and around the world. You can expect to bet on major competitions for CS:GO, Dota 2, League of Legends and Overwatch, and find occasional betting options for less popular esports events for Hearthstones, Heroes of the Storm, Rocket League, StarCraft Brood War, World of Tanks, World of WarCraft and so on throughout the entire year. The site takes moneyline wagers (Match Winner), point spread, over/under, parlays and outright bets on all esports events. There are prop markets for some esports, with the most common being Map Winner, and game-specific markets such as First Blood and Pistol Winner in CS:GO, First Baron or Tower in League of Legends, or Total Kills Per Map for Dota. There’s also the live betting platform at Sportsbetting, but the amount of esports events you can bet on in-play is limited based on our testing so far. Sportsbetting has an easy to navigate esports betting hub with links to live-streams for all available markets. The esports section of the Sportsbetting.ag site is its own hub and is easily accessible in the main navigation bar of every page across desktop, where you can preview the latest markets as a guest or while logged in. The overall interface is clean and easy to understand for both new and experienced esports bettors, with all betting options neatly categorised by date under Live, Today, Early Markets and Outrights. You can quickly view the outcome of every resolved match in the Results section. All the esports you can bet on are neatly listed on the left-hand scroll bar and you can manually search for your favourite teams or leagues in the search bar. 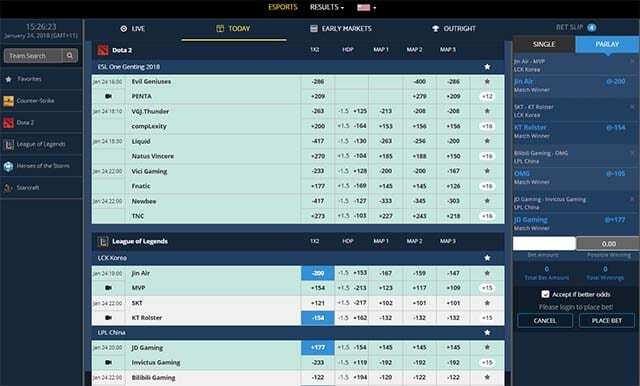 Betting markets are sorted by the esport and its individual leagues which may run concurrently, and you can find all additional prop markets (if available) with one easy click to expand the odds on-screen. The current date and time in your local timezone is displayed to make it easy to keep track of when the next match is and you can change the odds format to American, Decimal, Fractional and Hong Kong to suit your preferences. The betting slip to the right of the desktop site interface also makes placing single or parlay bets simple. It’s really neat to see Sportsbetting.ag offer direct links to live-stream video of the event in question, accessed by clicking or tapping the video icon next to each betting market. The Sportsbetting.ag mobile site is much blander than the desktop site and you can’t quickly check the latest esports odds without being logged in, and there’s limited functionality overall. Sportsbetting.ag have a decent range of banking methods available for customers to use for deposits and withdrawals. Compared to many other US-facing sportsbooks which are vague or offer minimal information for each payment option available, Sportsbetting.ag is much more transparent and its larger list of services will suit most North American users. Here are the current available options, along with minimum and maximum limits you must reach, to deposit and withdraw. We found payout requests to be fairly prompt, with the site processing them Monday through Friday between 9:00 a.m. ET to 1:00 p.m. ET (excluding public holidays). As always, identity verification and documentation is required to successfully request a withdrawal of potential winnings in your account, so make sure you get that in order first should you sign up for an account. The United States Dollar (USD) and Bitcoin cryptocurrency are the only currencies supported at Sportsbetting.ag, due to the site catering mainly to customers from North America. If you sign up here from elsewhere, expect exchange rates and the many fees associated to get your money in USD or Bitcoin to successfully bet with Sportsbetting.ag. Sportsbetting.ag by default is displayed in English but a Chinese language option is available by clicking on the flag icon in the drop-down menu of the sportsbook. The site has English-speaking staff on-hand for questions via a variety of different contact methods, though they were not always prompt with their answers or solutions, but friendly enough. In our tests, they were able to help with esports-specific enquiries and were generally resourceful in clearing up the minor deposit and withdrawal issues we faced. A solid sportsbook for Canadian and North American customers looking for a safe, secure esports betting experience. Interface is still a bit plain and on mobile it’s a mess, but it gets the job done and has the latest betting markets for all major esports and their multiple tournaments. Ready to start betting? You can get some exclusive welcome bonuses on us if you sign up to Sportsbetting.ag through our links and follow the prompts to claim your reward.